Select the desired resolution to fit your project. Record in UHD 4K resolution up to 60 fps or switch to lower resolutions such as 1080p and 720p for access to higher frame rates, more FOV (Field of View) options, and electronic stabilization. In 2.7K widescreen and lower resolutions, for instance, narrower FOV options open up including Medium, Narrow, and the new Linear mode (only available in 2.7K and 1080p settings), which corrects the lens's barrel distortion. Box Dimensions (LxWxH) 8.9 x 4.1 x 2.6"
HERO6 Black is rated 4.0 out of 5 by 64. Rated 5 out of 5 by Greg S. from Great camera.... Great App This is not an upgrade review, but rather just to let others know that the Hero 6 Black is pretty impressive. I debated whether to go with the 5 or the 6 and decided to go with the 6. I have not been disappointed. I wanted to have the option to shoot 4K at 60 fps and Slomo at 240 fps. The difference in price did not matter to me. The GoPro App knows when I have new footage and asks if I want to bring it over to my iPhone. The App then preps the footage to share. I also like having the underwater option, something I cannot do with my Canon 1Dx, ,5DS, or Sony A7rII. The stabilization works well too. I hope the company gets through is current difficulties. Rated 2 out of 5 by Ryan from Not great for Low-light, concert video I am sure the GoPro does well as the "action cam" for outdoor filming in good light - so I'm not trying to knock it.? My review is specifically geared toward low light and concert photography.? I was tasked with filming a concert tour and resorted to implementing GoPros on stage to get more coverage of a large band.? I was immediately dissatisfied with the noise level and how quickly the image broke under colored concert lights.? I'm not saying it is a bad camera, but I would stay away from it for these purposes. Rated 4 out of 5 by Jason from Solid little camera! This is my first GoPro, and I am quite impressed with it overall. The video quality is quite good so long as there's sufficient light. Because of the small sensor it's pretty bad indoors in low light, but outdoors in bright light the footage is vibrant and colourful. The stabilization works fairly well, though it's a shame it doesn't work at 4K/60fps, only at 4K/30fps. Battery life is definitely short, so buy a second one. It has frozen up on me a few times so I've had to pull the battery; I hope GoPro continues to improve the firmware. Rated 5 out of 5 by Rory from The Key is to Accept it's Limitations I intend to use this while flying an airplane and riding a motorcycle. For me, the principal limitations are abysmal low light performance, unacceptable sound quality and understandably limited battery life. The solution is to not use it in low light, to record sound to a separate recorder and to purchase additional batteries. 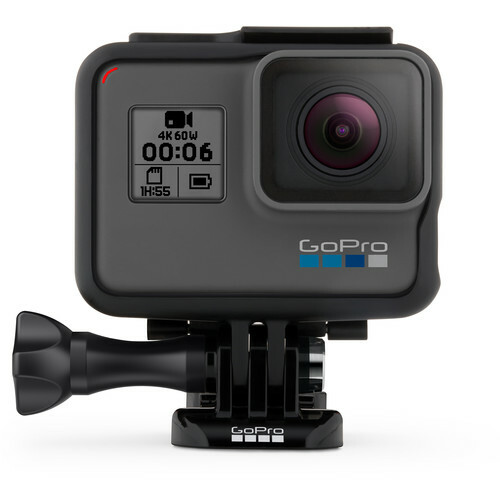 Those issues addressed, I think that it is an ingenious camera with an excellent user interface, and reasonable value now that GoPro is pricing the camera more realistically. I will probably purchase a second GoPro. On price, the Hero5 Session is very attractive, but the look is different. I'm inclined to think that a second Hero6 will save enough time and annoyance in processing to make up for its higher price. By the way, I'm using the camera with Sumsung Evo Plus 64GB cards, and they work fine. Rated 3 out of 5 by Martha from Was expecting more The picture and video quality is great, but the battery life is very poor, the camera responds very slow, gets stuck in saving mode for no reason and I have lots of random upside down videos. All of this with the latest software. I'm comparing it with a Hero 5 Session which I used before. Also the charging cable is very short and I can't charge it while driving without buying more stuff. Rated 3 out of 5 by Ashley from Seems very glitchy I'm still debating on whether I want to return the Hero6... I got it right before a snowboard trip and started using it immediately and was having problems from the get go.? Yes, the quality of the video and photos are amazing, but when the camera doesn't charge or turn off or record when it doesn't feel like it, then it's quality doesn't matter.? The camera charged just fine at first then about 4 days later, I had it plugged into a wall outlet and the red light was on like it was charging, but when I grabbed it the morning, the battery was still at 10% which was a huge bummer!? But then it charged fine in another spot... I am a semi-professional videographer and planned on using this in my work, but I'm not confident on its reliability!? I can't show up to a shoot and the camera won't turn on or charge while I'm there... I also need to be able to charge it on the go in the car if need be like I did with all my other POV cameras ever and this one doesn't want to. Rated 1 out of 5 by Colin from 4K/60p Disappointment / Sun Flares Have Single Ray I just bought this and tested 4K/30p vs. 4K/60p. I'm very disappointed in the 4K/60p. The footage is grainy and the audio/video is way out of sync no matter what PC / video card I used (both are i7 PCs). I filmed using an ND4 and a PL filter. The 4K/30p footage is decent and the new stabilization works pretty well, but the footage has a very intrusive single ray of light when pointing at the sun. I wish I had kept my HERO5! Rated 5 out of 5 by Jon from Best gopro yet, worth the extra $100 over the 5. The stabilization feature works great and 60fps at 4k make this camera ABSOLUTELY worth it over the gopro 5. The only reason you would get the 5 is because you want to use the karma grip/drone, but i think those are both overpriced and sub-par. Also if you are thinking of upgrading from a 3/4 black, just sell your old one and do it. This thing makes my old 3 look like a retro toy, and the touchscreen makes getting the shot you want much faster. I see reviews that seem to contradict each other and are all over the place. What gives? Are a large percentage of these cameras bad or need to be returned? does this provide plug in power for a mic? puedo comprar y enviar la cmara a Mxico? Debido a las regulaciones de exportacin y / o las restricciones de los fabricantes, no podemos aceptar pedidos con una direccin de envo en MXICO para el Gopro. Does the clock in the GoPro HERO6 automatically synchronize the date/time settings with the GPS clock? Thanks. Can you enable EIS while shooting 4K, or only 2.7K? If so, is it possible to shoot 4K EIS at 60fps, or just 30fps? EIS is not available when shooting 4K 60 fps or 1080p 240 fps. It is available while shooting 2.7k 60 and 1080p/120. I have the hero 4 silver and was thinking of upgrading to the hero 6. I'm interested in the hero 6 because of the raw photo capabilities, which the hero 4 does not have. Does anyone know how much better is the raw photos verses the jpg photo with the hero 6?